I came to Philip Pullman’s “His Dark Materials” series as an adult when I was required to read the first book for a university class, but I absolutely loved it. 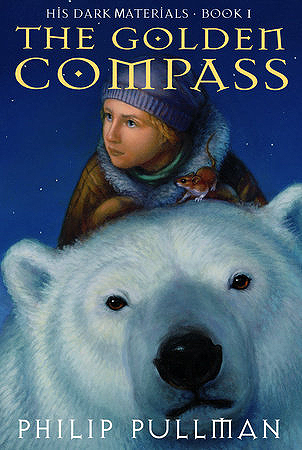 Since Pullman has just announced that he is writing a companion series, I thought that this would be a great opportunity to review the first book in the original series: The Golden Compass. This is such an interesting fantasy series. It’s ultimately a coming-of-age story for the precocious protagonist Lyra. Watching her grow is a delight, and the interesting characters are mixed with an exciting plot. This is a great start of a great series. While Lyra’s growth is integral to the series, the character in this book that intrigued me the most was the larger-than-life Mrs. Coulter. I don’t want to give away any of her secrets in case I spoil something for new readers, but she was written in such a way where I could absolutely feel the same level of intrigue that Lyra felt when she looked at this complicated woman. The fantasy elements in this book are very clear, and they have a great balance between traditional and new when it comes to the structure of the world-building. There is a traditional quest and hero and sidekick and wise elder. However, the freshest thing about this book is the addition of personal daemons – individualized creatures that are connected to each person. Each one takes the shape of a specific animal and have a very close bond with their human. This is such an interesting take on a spirit animal since they are tangible and seen by everyone. Overall, I think this is an amazing, fast-faced book that people of all ages will enjoy. I can’t wait to read the new trilogy that Pullman has in store for us!